DILLINGER FOUR 21st Birthday Tour! 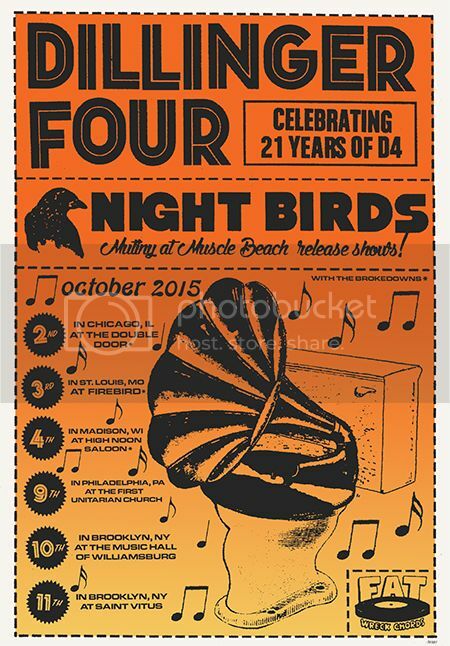 Dillinger Four are turning 21!!! Holy crap! Yes, it’s true, and they’ll be hitting the road in October to commemorate this milestone. Come out and buy them some shots now that they’re finally legal. Just to make sure it’s a proper celebration, Night Birds will be along for the ride , blasting out songs off their upcoming album Mutiny at Muscle Beach. If that lineup doesn’t get you pumped, you may not be cut out for this punk-rock thing.